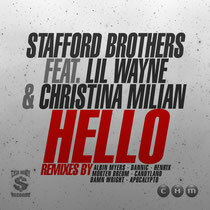 Australian production and DJ duo, the Stafford Brothers, recently announced the remix package for their track, ‘Hello’ featuring Lil Wayne & Christina Milian, that will be released on Monday, February 11 via Cash Money Records. As the very first DJs signed to Cash Money Records, the brothers are continuing to grow their influence while making a statement with their first Beatport remix package. The package includes remixes from Albin Myers, Dannic, Henrix, Morten Breum, Candyland, and Apocalypto. Kicking off the 'Hello’ remix package, Sweden's Albin Myers, offers a melody-driven electro-house track. Revealed Recordings’ Dannic brings his progressive house rendition and Tijuana-based producer, Henrix, keeps up the diversity with a remix that blends several different elements into a cohesive track. Recent Los Angeles transplant, Morten Breum, taps into some heavy artillery for his electro remix complete with a dubstep bridge. Candyland, the co-ed dance music duo, deliver a UK garage-influenced downtempo mix with plenty of low-end. Rounding off the package, Them Lost Boys put forth a snarling, distortion-infused effort while Apocalypto shines through with peak-time big room energy. Have a listen below.